With dynamic musical taste and timing sharper than a razor, Sterling Moss is renowned for his technically explosive DJ style that never fails to electrify crowds the world over.Having toured extensively in over 25 countries throughout North America, South America, Europe, Asia, Africa and Australia, Sterling regularly rocks dancefloors around the globe in an exotic list of locations, playing at clubs and festivals to hundreds of thousands every year alongside the world’s DJ elite.Once resident with Dancevalley & HQ in Holland and Tribal in London, Sterling now serves a residency with Harley Davidson as tour DJ on their Bike Festivals, having played for over 7 years with them at destinations all round Europe, culminating every September with the 100,000 attended European Bike Week in Austria. 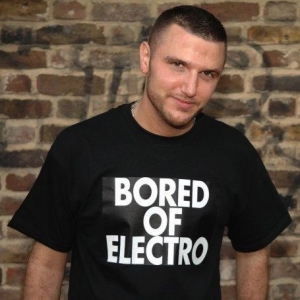 Music production has remained the in-demand creative mainstay of Sterling’s abilities, including UK chart success and his own label catalogue of Raceway, Racetrax and 99.9 supporting his musical output onto more than 40 other international imprints including: Stay Up Forever, RAW, Hydraulix, Cluster, Hardasfunk, Wah Wah, Subcult, Neuroshocked, Powertools, Yolk, Scythe Squadron, Polymeric, Apex, Hellhouse, Nukleuz, One Inch, Rotters Golf Club, Sweet Peaks, No Entry, Strata, BR-909, Carbon Audio, TMM, Keep On Techno, Corrupted, Corrosive, Teknic, Braingravy, Bordelik, Flatlife, Maximum Minimum, Aktivists, Abusive 303, Acid Corp, Bodyshock, Project 303, Celtek, Skyride, Hive & Torque.Sterling has worked alongside the mighty Stay Up Forever crew for the last few years, tirelessly stoking a 303 & 909 driven rebellion in the studio alongside Chris Liberator to create a huge body of work that has ripped dancefloors apart across the world with devastating effect. They have sold out events in countries including Australia, Japan and Brazil with their live show, their remixes of Sicknote, Tribazik, Miss Djax & Patrick DSP and Dynamo City’s ‘One Night In Hackney’ are universally acclaimed, and their genre defining hits including: ‘Croydon Girl’, ‘Punk Attitude’, ‘I’m Bored’ and ‘Massive Line’ will be making waves for years to come.‘E.S.C.’ is another alias Sterling has recorded under as part of ‘The Boardroom’ collective with Steve Boardman. Their work saw its way onto two highly acclaimed collaborative albums with Andrew Weatherall, which gained rave reviews universally from the music press. The collective has also played live at some of the world’s most prestigious venues including London’s ‘Fabric’ & Berlin’s ‘Panorama Bar’.The ‘Sound Lab’ studio is the nerve centre for Sterling’s production work, but he also worked extensively alongside Roland Synthesisers Japan as an official programmer on their MC-909 Groovebox, after they were impressed with his use of their vintage TR-909 drum machine. He has also released two sample packs with Chris Liberator through New York’s Industrial Strength Records, which contain a wide-ranging palette of sonic tools for up and coming producers to utilise.While constantly striving to innovate with his productions and DJ’ing, Sterling Moss always looks to explore new musical territories and ideas, while relentlessly touring his compelling sound around the globe. This entry was posted in Uncategorized and tagged acid, sterling moss, techno. Bookmark the permalink.